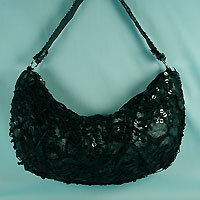 Large hobo bag in faux leather covered by a loosely crocheted net with sequins. This is a great dressy bag for evening where you need to carry more than a traditional evening bag will hold. The sequins give it a glitzy look but it is the size of a basic handbag. It is fully lined with a small pocket inside and a zipper closure. 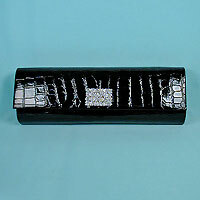 Measurements: width 13", height 6", depth 1-2"
Long faux croc evening bag with large rectangular rhinestone ornament on flap. This purse includes both a removable faux leather handle and a shoulder chain and has a snap closure. This is a beautiful and versatile classic clutch bag for any special ocsasion. 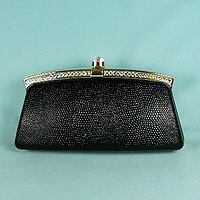 Measurements: width 11-1/4", height 3-3/4", depth 2"
Dramatic satin clutch bag with large crescent rhinestone decoration. 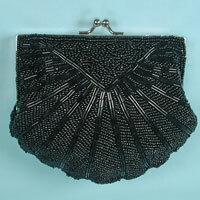 This gorgeous evening bag had a curved flap with pleats that flare out to the top in a sunburst design. The clasp is styled with a large crescent consisting of pave crystal rhinestones. It includes a removable shoulder chain with a 21-inch drop, satin lining with a small pocket on the side and a snap closure. This stunning but basic evening clutch bag will complement a wide variety of evening attire from a formal dress to a tailored theater suit. 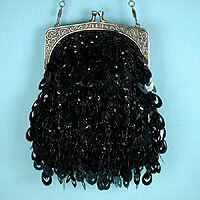 Measurements: width 10½", height 3-3/4", depth 2"
Long clutch bag with feathers and beads. This beautiful evening bag clutch is made with sparkle satin and full front flat is covered with black and black and white feathers. The top of the purse has a beaded and sequined design and the back is plain fabric. It has a snap closure in the flat, is lined in satin with a side pocket. Included are both a 14-inch double snap detachable handle and a shoulder cord with a 22-inch drop. It is long and roomy and will easily accommodate a cell phone and several personal items. This gorgeous and unique evening clutch is a great fashion accessory which should complement any outfit. 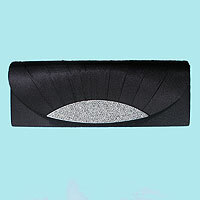 Measurements: width 9½", height 4=14", depth 2"
Faux leather clutch bag with wrist strap. 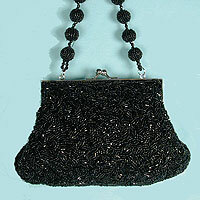 This stunning evening bag a smooth grain finish to the back and is decorated with large chunky stones on the front. The stones alternate in shape from large round to rectangular. It has a zipper closure with a large rectangular stone on the pull tab. The inside is lined in satin with a zippered compartment on the side. 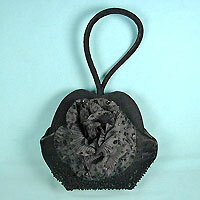 It&squot;s a perfect little purse to wear as an evening bag or as an envelope clutch for day. There is room for a cell phone, small wallet, keys and other personal items. Measurements: width 8-1/4", height 5½", depth 1"
Faux leather wrist pouch style purse with crystal rhinestone clasp and ring handle. Includes a matching shoulder chain with a 24 inch drop. Measurements: width 8½", height 5", depth 2½"
Long satin clutch purse or evening bag with pleated flap and rhinestone ornament. This beautiful bag has a full flap with pleats that meet in the center. An oval pav? clear crystal rhinestone ornament is posited over the center of the pleats. It includes a matching shoulder chain with a 21-inch drop, is completely lined with a side pocket and has a snap closure. This stunning bag comes in several colors and is perfect for any evening occasion. Measurements: width 10", height 3½", depth 2"
Color: black. Hue: black. color code: #000000. Type: silver. Long elegant satin evening clutch bag. 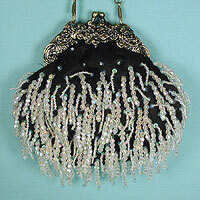 This evening bag has a pleated flap finished in a five line rhinestone wave design. The detachable hidden shoulder chain has a 22 inch drop and it has a center snap closure. The inside is lined in satin with a pocket on the back. 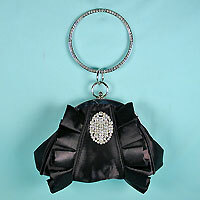 This is a classic evening bag for a prom or any special occasion. It will add a sparkle to your outfit. Measurements: width 10", height 4", depth 1-3/4"